It's been far too long since the last post, but here's a great old photo of what was described in an inscription on the back as the Neuman Brothers saloon in Boyle Heights. Update, 25 August: The reverse of the card lists an address of 1248 E. 4th Street at or near State Street, though State is actually at the 1900 block of 4th. The unused real photo postcard (the first couple of decades of the 20th century was a popular period for having photos printed onto postcard paper for easy mailing) is a rare interior shot of a commercial building in the neighborhood. It is assumed the Neuman brothers are the guys behind the bar, while their lone patron, dressed for winter apparently with his overcoat over his suit jacket, sports a sharp mustache and jauntily holds a cigar in his right hand. 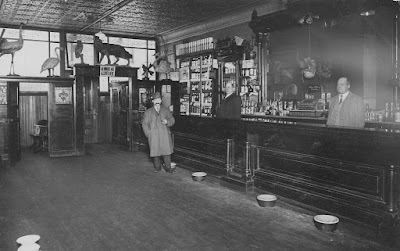 Note the several spittoons strategically positioned at the bar and at the lower left--chewing tobacco in drinking establishments was a common thing in those days and long before! Purchased by the Homestead Museum, City of Industry, from Roger LeRoque, whose family lived in Boyle Heights in the early 1900s, this real photo postcard shows the interior of what was labeled as the Neuman Brothers saloon. The bar itself was pretty impressive with its sleek, polished top and carved columns and check out that massive mirror along the back wall. An office with Tiffany-style glass windows is at the left and the covered entry sports the expected "NO MINORS ARE ALLOWED HERE" sign (whether or not that was actually true!) There's a bit more of that glass work at the top of the plate glass windows, too. Also noteworthy are the swinging doors, sometimes called "saloon doors," "tavern doors," or "cafe doors." Check out all of the stuffed animals ("taxidermy" is the term) placed above the office and entry, as well as the molded tin ceiling tiles that were very popular at the time. And, of course, the place was amply stocked with the choices in liquors, beer, and wine. Finally, make note of the cash register which was probably very busy ringing up those sales when the place was packed (assuming it was sometimes) with patrons, especially weekend evenings. Contribution by Paul R. Spitzzeri, museum director, Workman and Temple Family Homestead Museum and advisory board member for the Boyle Heights Historical Society.